As one leaves Stoney Middleton on the A623 there are a number of obvious entrances in the cliffs above the last houses and the Lovers Leap Garage. None are of any extent, except that one is a mined entrance and is blocked at an unfilled shaft to surface beyond which there may be extensive workings. The small tubes above the garage can be seen to lie on one of the higher prominent bedding planes. throughout. Entrances in the large embayment to the west go nowhere, but then we arrive at the obvious entrance to Keyhole Cave, reached by an easy scramble. 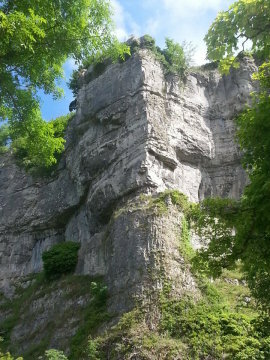 This is formed at a similar level to Windy Ledge, and again it passes right through a buttress, with a window in the sheer cliff face halfway through. The cave emerges where a large mineral vein, Cliffstile Vein, crosses the dale, and some scrambling is necessary to descend to the path. There are a number of caves in the vicinity of the vein. 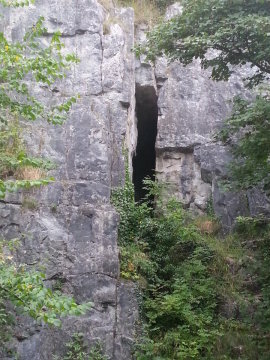 The principal one, Ivy Green Cave lies in a right angled corner of the cliff, and is difficult to reach involving a tricky climb. It is effectively the continuation of Keyhole Cave, the cave having been intersected by quarrying and isolated. Ivy Green is the most extensive so far, and is about 800ft long. It involves some tight squeezes and flat-out crawling, and was the scene of a tragedy in 1989 when a young lad from Eyam disappeared. He was not a caver and had no equipment, but was known to be fascinated by the caves. Despite an extensive search he was not found, until a year later cavers found his body 300ft into Ivy Green Cave. How he reached this point is unclear, but it is a salutary lesson to casual visitors who might venture further than their experience or equipment allows. Cliffstile Vein runs north eastwards from this point, and Cliffstile Mine, 300ft deep and covered with a steel lid, is soon reached. Many other shafts are marked by hollows, and some may be open beneath a rotting timber cover. The area of pasture to the east of the vein is criss crossed by scrins, and once again there may well be undetected open shafts. Back in the dale, the track leading up from the road opens onto a broad ledge, known as the The Gin. An entrance by the side of the track leads shortly to the bottom of an open slot at the base of the cliff, and the passage continues into mine workings. Digging gained access to a natural chamber at the end of a branch working, but the connection is often flooded. The main level continues, beneath unstable stacked waste rock (deads) in places, to an unstable and partly collapsed shaft. The largest entrance in the dale closely follows. The climbers call it Fingal’s Cave, and it is a mine on a vein called Nut Scrin. It begins as a very tall passage, the walls of which are coated with a film of minerals including blue fluorspar. 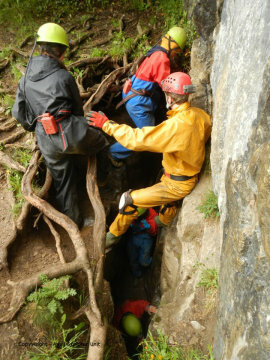 After scrambling up a steep slope it reduces to the usual small mine level. At the end it intersects a natural passage, blocked in both directions. The passage lies at the same level as Ivy Green cave, and a strong draught suggests a connection. At the end of The Gin a large hole surrounded by tree roots is the most used entrance to Carlswark Cavern. An easy scramble down leads to a crossroads with the main passage, Eyam Passage. The way on is to the left, and soon opens into a large chamber, known as the Oyster Chamber from the large fossils etched out on the roof. They are shells of the brachiopod Productus giganteus, which occur in a band at this level throughout most of the dale. The fossil bed is referred to as the Lower Shell Bed. It can be seen that the cave is formed along a prominent bedding plane below the fossil band, and it is likely that this open bedding plane was in fact a thin clay band. 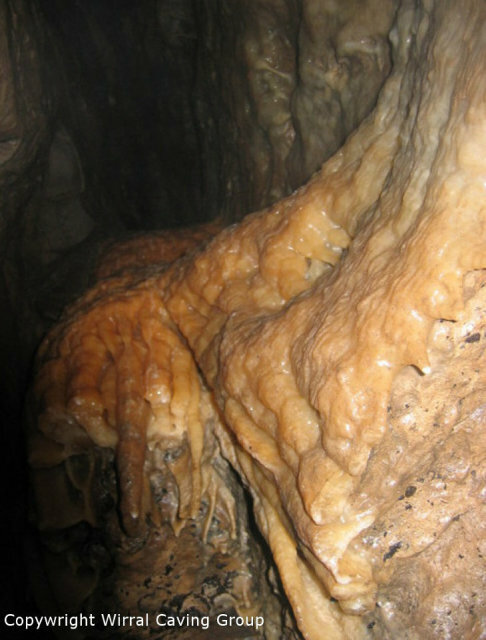 The clay prevented further downward percolation of water through the limestone, so the water found its way along the surface of the clay until, over many millenia, a network of tubes formed. Some were enlarged until they formed the major passages of Carlswark Cavern. In the floor of the Oyster Chamber is a hole down which a tricky climb leads to a lower passage, and an entrance at road level. Beyond the Oyster Chamber the main passage, Eyam Passage, stretches away. After many twists and turns, crawls, deep pools and side passages it is possible to find ones way to the bottom of a shaft to daylight, which emerges on the left hand side of the road up Eyam Dale, opposite the electricity sub-station. It is this through trip that provides the school parties with their entertainment. In the network of small passages close to the Eyam Dale Shaft the author got lost with a friend at the tender age of thirteen, having entered by the Lower Entrance. We were lucky and managed to retrace our steps until at last we saw distant daylight with the final flicker of our last candle! I can’t describe the panicky feeling of realising that you are lost and running out of light. Our parents never knew. Eyam, and another tight entrance lies close to the Eyam Dale road further up the hill. In very wet weather the stream overpowers all outlets, and roars on through the cave to emerge at the entrance at road level, the Lower Entrance, where it can cause chaos if it overflows onto the main road. In normal weather the Lower Entrance passage can be followed to the slippery climb which leads up into the Oyster Chamber. Beyond the climb the cave is flooded, and this sump was the scene of a dramatic rescue on 7th July 1965 when junior soldier John Stevens dived into it. He was incredibly lucky, and came up in an air space where he sat in the dark for many hours until he was found after the sump was pumped out. High above the Eyam Dale Shaft is the entrance to the Merlin Mine. This is another extensive complex of old lead mine workings, and its lower levels again intersect natural passages carrying the stream which emerges in Carlswark Cavern. The Merlin Streamway can be followed in drought to a point beneath Cucklet Delf. The mine connects to Carlswark Cavern through a series of dry passages, and also through a flooded section which has only been passed in extreme drought. Between Eyam Dale and Cucklet Delf there are a number of mine levels, and one short natural cave, Beech Tree Hole. By the path up Cucklet Delf is a large vertical hole surrounded by a fence. This sinkhole was excavated in the 1980s, and was found to be partly filled with domestic refuse. The bones included red deer among other domestic animals, and the oldest piece of pottery turned out to be red Derbyshire Ware, of Roman age. 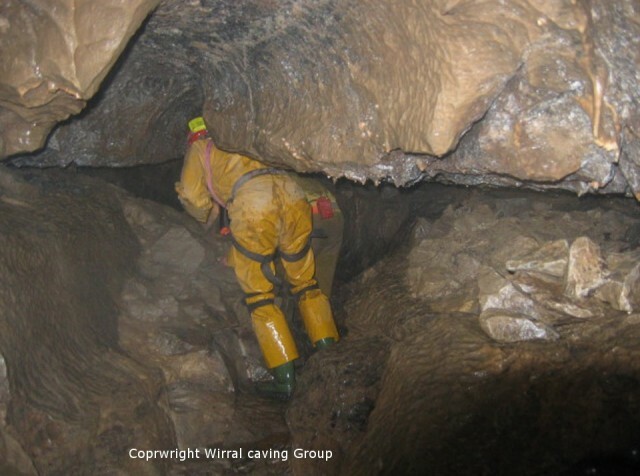 In flood conditions it can engulf a large volume of water which is not seen in the known caves but reappears from the Boil Up, in Glebe Mine where all the water from the swallets enters the mine. High on the west side of the Delf is Nickergrove Mine, another extensive complex high on the west side of the valley. Nickergrove Mine has several entrances on the valley side, and once more its lowest level intersects natural cave. The Merlin-Carlswark stream is again seen here for a short distance between two sumps, passages which are flooded to the roof in normal weather. The stream is next seen in Streaks Pot, which is entered high above the road close to the Streaks Path, which winds up the dale side from the sharp bend on the A623. A muddy crawl leads to the head of a 40ft drop, and leads on down through chambers and climbs to the stream, 100ft below the entrance. The stream can be followed to the upstream end of the sump in Nickergrove Mine. A side passage leads to an entrance close to road level, and the cave can be followed westwards to a final choke deep beneath the spoil heaps of Furness (Horseshoe) Quarry. This choke is, in effect, the closest that the known cave comes to the main sinkhole, Waterfall Swallet, near Foolow, where the largest stream feeding the system disappears underground. To the west of Streaks Pot the only cave of significance is Lay-by Pot, 1200ft of passages entered via a 50ft shaft just above the road, opposite a lay-by. Again a through trip is possible, emerging through a short shaft a little further east. There are many other entrances: during the search for the lad who went missing from Eyam in 1989 it was established that about 70 entrances needed to be investigated. It is important to stress that entering any of them without proper equipment and experience is potentially lethal.